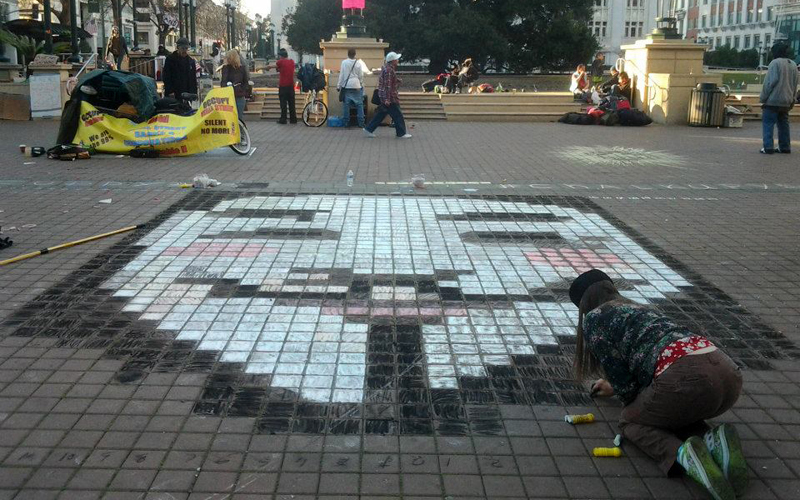 The group of activists that I was a member of at the time, Fresh Juice Party, came to chalk because the words “Occupy Oakland,” written in chalk where the Occupy Oakland camp had formerly been, had been washed away. Since the police said we could “put it back” we did. We chose a Guy Fawkes mask because a lot of people in the movement wear them and have been demonized for masks to some extent. It makes it harder for the state to identify you and arrest you for something later. As a white woman of means, masks are less necessary for me. I applied some of the skills I had learned back in the days when I was a billboard painter in laying out the 20’ high drawing. We bought regular school chalk which was very hard and made our hands sore and tired covering those large areas. Black was charcoal, bought at the art store and some pink for the cheeks. 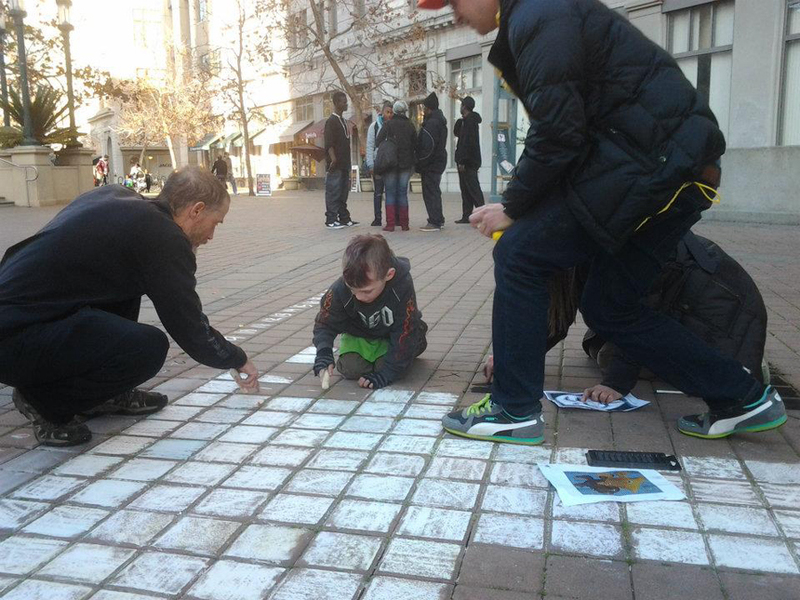 We were surprised when a few people, including a young boy, knelt right down to diligently help us. 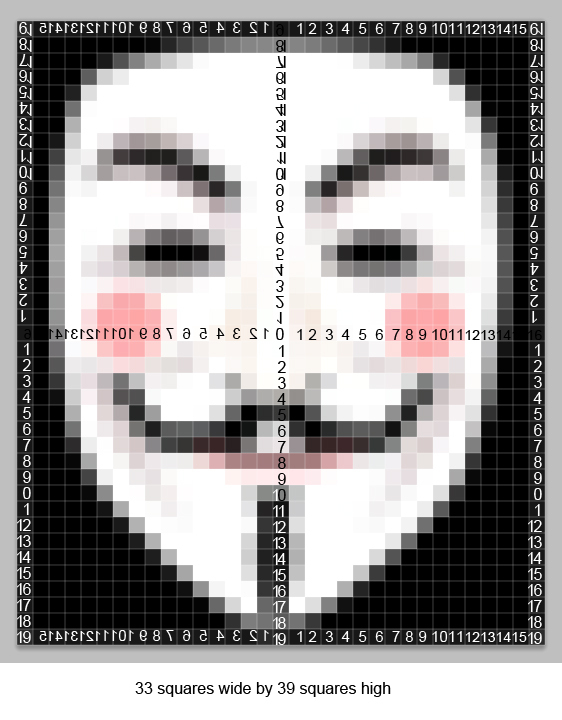 This first design was pixilated like a Chuck Close painting. It took quite a while to match up the squares right on the computer so that the design wasn’t so complicated that it needed too many squares or so simple that it wasn’t recognizable.